Holy Half-bloods, I didn't think it was possible to love Aiden St. Delphi any more than I did but OH.MY.AIDEN! I have been anxiously awaiting this novella for several reasons, the most obvious being, this is Aiden's POV. (Duh!) AIDEN! *shakes you to make sure you're paying attention* the uber hot Sentinel whose always so guarded (no pun intended) with his feelings and having the chance to get inside his head and heart is better than winning the lottery! Elixir is the perfect addition to The Covenant Series and not just because it's Aiden's POV. (If you can't tell, I'm Team Aiden) It has all of the elements I love so much like humor, romance and action, although the action in this novella is more the battle Aiden wages with himself. He feels responsible for what's happening to Alex yet helpless to fix it but a little comic relief is never far away, especially when his brother Deacon is around. "I know." Deacon grinned. "I'm just awesome." Surrounded by others who are concerned for Alex as well as the fate of the human race, Aiden seems to be the only one determined not to give up on her or give in to the fear. His struggle to do what's best for Alex, despite her new split personality, is both endearing and heart-wrenching. *clutches chest* But he is determined to protect her no matter the cost and he doesn't shy away from encouraging her to fight because he knows what Alex is made of, what she can do. He wants to help her overcome this change that is threatening to rob her of who she is even if it means risking his own life to do it. This was so refreshing, to see a little snippet into the almost perfect Aiden's head, we get to see how truly hard it was for him to give Alex the Elixir and it also gives more insight into why he said he would never forgive himself. To see Alex this way was so sad and yet... kind of cute in a sick way. I don't know where I'm trying to take this but I enjoyed this novella and wished it was longer. Good Gods, Best Novella I've EVER Read. This has to be one of the best novella’s I’ve ever read. It probably is the best. 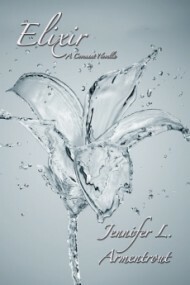 In less than 80 pages, Jen is able to show us a whole new side and perspective of Aiden’s character. From all of the other books in the Covenant series, we see Aiden in Alex’s POV. He seems perfect, calm, and collected. Her prince and knight in shining armor. Yeah, Aiden doesn’t exactly view himself quite that way. He is much more complex than anyone could have guessed, and he has his own internal struggles to face even though he needs to be out there to support Alex, especially after the events in Deity. He is...much more aggressive than I thought he was. It was also nice to see Aiden’s perspective of Alex, which is comparable to Alex’s view on Aiden :). You mean he’s a total perv. He’s like: OMG ALEX’S LEGS ARE SO....PURTY. It is a great Covenant installment, and definitely isn’t something you should skip over! Sometimes you can skip novellas in a series and still be okay, but I think it’s really beneficial to actually read Elixir. Plus, it helps feed your never ending thirst (or at least my never ending thirst AND DANI’S) for more of Covenant. Can’t wait for Apollyon to come out in April!!! Aiden standing up for Alex. Where to start?! Of course I LOVED it because everyone knows I LOVE Aiden. But this novella from his POV was very hard to read. It was gut wrenching and I felt so bad for him. He was very emotional and I wanted to crawl in the book and comfort him myself. It was a nice change to be in his mind and see the love he has for Alex. He is no doubt the most wonderful, sweetest book boyfriend ever. I also felt bad for Alex. Although she was being a certified crazy person, none of it was her fault. I don't believe that anything she did was her for a minute. Then when she had that "breakthrough," I really felt bad because I even knew it wouldn't last. Watching as she goes through this is like slamming my finger in the door time after time after time. It hurts. She was so strong and him taking her over like this makes her seem like a weakened, broken shell and I HATED it. But overall, this was a great installment to the Covenant series. A war is brewing and Aiden seems to be the only one not reacting to the fear of the Apolloyons. He seems to see what everyone else does not, all for Alex's sake.